With the peak of summer behind us with the passing of the 4th of July weekend, I am sure we can all admit that over the past few weekends there has been one too many cookouts that we have attended. Perhaps we ate one too many hot dogs, hamburgers, or slices of watermelon, or perhaps we should have passed on that extra scoop of ice cream, potato salad, or slice of apple pie. Regardless, it is time to get back into shape, and the best place to start is with our dietary intake. 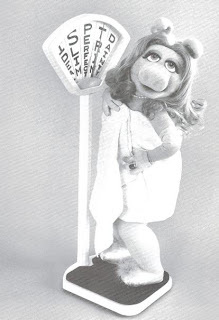 In 1981, in Miss Piggy’s Guide to Life, Miss Piggy discussed in depth the best way to maintain a successful diet. Below is one of her many helpful ideas for dieting. This diet is in many ways my favorite. It is flexible, and it provides a wide variety of different dishes to choose from. Here is how it works. Get six or eight of the most interesting-looking diet books, pick the most appetizing recipes from each, and organize them into meals. For example, one noted diet makes you eat an awful lot of grapefruit, a fruit I find about as appealing as a beach ball. And yet, that very same diet lets you eat chocolate cake and non-diet sodas. Another popular weight-loss regime forbids desserts of any kind, but actually encourages you to eat your fill of French fries, ravioli, and quiche. And what a fantastic picture too - if only I had a set of scales like that!